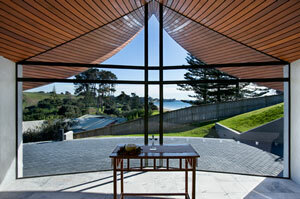 A sceptical visitor shuffles a little godward at Dayman Architects’ chapel in the grounds of the Vaughan Park Retreat Centre at Long Bay, Auckland. As an atheist the most religious I’ve ever got is when I was 15, reading my way one summer through our bach’s collection of Nevil Shute novels, and coming across his best. No, not On the Beach, but Round the Bend. In that 1951 novel, which preceded your Zen and the Art of Motorcycle Maintenance and later sheaves of new age spirituality, the protagonist, aircraft engineer Connie Shaklin, founds a new religion based upon Good Work. Understanding the stresses and forces and problems in the structure of an aircraft and the workings of its engines is, among other things, the way to enlightment. 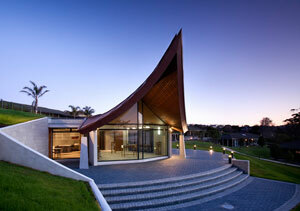 This little chapel at Long Bay, Auckland, by Greg Dayman, is intriguing. Vaughan Park is an Anglican retreat and conference centre on a lovely site next to the beach and regional park. The chapel roof might strike you as a dominant feature but it is the transparency of the place that I have been wrestling with. Usually chapels have distractions like art and coloured glass and tortured Jesuses or sad Marys but this one, which can accommodate 20 people, looks straight out on a particularly nice stretch of beach, if you can just get over that hurdle of a fence. How do you critique a church? 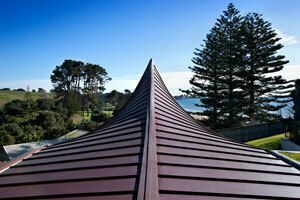 The roof shape apparently symbolises a waka; the boat is an early symbol of the church and is utterly relevant here. But this coppery horn could also be read as hands clasped in worship, or as the flower of the kowhai ngutukaka, the kakabeak. There is a warmth and peace about the whole Vaughan Park site and its cedar lodges; the place infuses you with a sense of goodwill before you arrive at the chapel. I’m told the chapel in fact starts at the front of the path, not the building itself. The building, apart from its rearing crescent prow, is hidden away beyond the curving path and buried into the hillside to preserve the views of residents and neighbours. It is prominent but not dominant. There is a Wrightian cosiness about the curves and pergolas and timber but there is a bareness, openness and clarity as well in the main space that doesn’t so much focus on that lovely prospect, somewhat eclipsed by the fence, but throws you back on yourself. The chapel, which won a 2007 NZIA Auckland branch award, has an integral study space and theological library nestled alongside. (There are five underground workstations in the library/research area.) The purpose of this place, this retreat, is reflection through prayer and research. The doubting narrator of Round the Bend wasn’t sure about the divinity of his friend, the engineer – “Connie was a human man, a very, very good one – but a man”, however he did sense that on the airstrips of the desert and the jungle, in the hangars of the Persian Gulf and on the tarmacs of the southern islands, he had walked and talked with God. Who knows, but in the clear-eyed calm of this place that provokes reflection and thought, and on the long beach of this bay, beyond the metaphorical fence, you may have a better chance of finding peace and your own god than anywhere else I know in Auckland. Not a god closeted in churches, but relevant to how you live and work and play. Make up your own mind.